On Saturday, October 7th, NYMA took a trip to Marvelwood after the SAT exam. Even though the score ended up being 6-1 Marvelwood, both teams played their hearts out. Cadet Remy Sykes, Alvin Lukose, Brandon Fooks, and Nigel Petti-Fernandez all played great and stood out for NYMA. Petti-Fernandez scored the one goal for the Knights. Both teams demonstrated good sportsmanship and fair play. We would like to thank Assistant Superintendent, Mr. Jonathan Gastel, for accompanying the team on their trip! The Knights were supposed to play this Wednesday against Woodhall Academy, but they had to cancel the match. We will try and reschedule this game if the schedule permits. 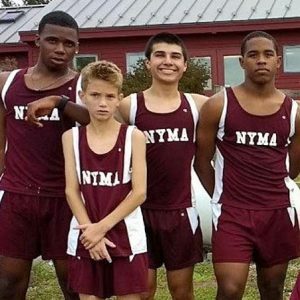 Saturday, October 7th, the NYMA Knights took the long drive after the SAT exam to Darrow for their cross country meet and they took home first place! Miss Larabee was on hand to help with the coaching duties and she was amazing! Also adding a giant contribution to the entire day was Mr. Joe Ruiz who drove the team to and from Darrow. The boys especially loved Mr. Ruiz when they stopped for some dinner on the way back to campus! All of the Knights finished in the top 25. Cadet Matthew Montez came in 2nd, Karif Isaacs finished in 7th, Zamere Mckenzie came in 9th, while Zaahir Woody finished in 12th place. On Wednesday, October 11th, we hosted our first cross country invitational of the fall season. There were 88 total runners who participated in the event from the following schools: Oakwood Friends, Poughkeepsie Day, Faith Christian, Storm King, Harvey School, Marvelwood, Commonwealth Academy, Woodhall Academy, and our NYMA Knights. Sophomore Matthew Montes finished in 7th and the Knights came in 3rd overall. Storm King took home the championship plaque while Marvelwood finish in 2nd place.